Author(s): Dr. Kailash Chaurasiya, Dr. Sokolina I.A. 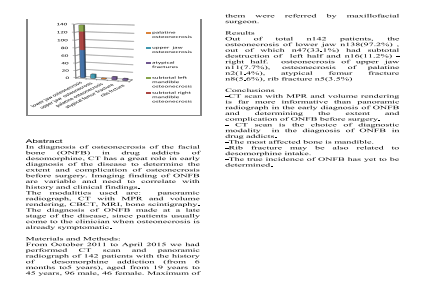 Abstract: In diagnosis of osteonecrosis of the facial bone (ONFB) in drug addicts of desomorphine, CT has a great role in early diagnosis of the disease to determine the extent and complication of osteonecrosis before surgery. Imaging finding of ONFB are variable and need to correlate with history and clinical findings. The modalities used are: panoramic radiograph, CT with MPR and volume rendering, CBCT, MRI, bone scintigraphy. The diagnosis of ONFB made at a late stage of the disease, since patients usually come to the clinician when osteonecrosis is already symptomatic. From October 2011 to April 2015 we had performed CT scan and panoramic radiograph of 142 patients with the history of desomorphine addiction (from 6 months to5 years), aged from 19 years to 45 years, 96 male, 46 female. Maximum of them were referred by maxillofacial surgeon. -CT scan with MPR and volume rendering is far more informative than panoramic radiograph in the early diagnosis of ONFB and determining the extent and complication of ONFB before surgery. - CT scan is the choice of diagnostic modality in the diagnosis of ONFB in drug addicts. -The most affected bone is mandible. -Rib fracture may be also related to desomorphine intake. -The true incidence of ONFB has yet to be determined. 6.Веселовская Н.В., Коваленко А.Е. Наркотики. – М.: «Триада-Х», 2000.– 206 с. 7.Катаев С.С., Гаранин В.П., Смирнова И.Ю. // Актуальные аспекты судебной медицины. Выпуск VII. 8.Сборник научных работ.- Ижевск: Экспертиза, 2001, С. 62-66. 9.Фармакология под ред. Аляутдина Р.Н. - М.: ГЭОТАР-МЕД, 2004.–591 с. 10.Nordal A. // Bulletin on Narcotics, 1956, Vol. VIII, N.1, P.18-27. 11.Small L. F., Yuen K. C., Eilers L. K. // Journ. Amer. Chem. Soc. 1933, V.55, P.3863.